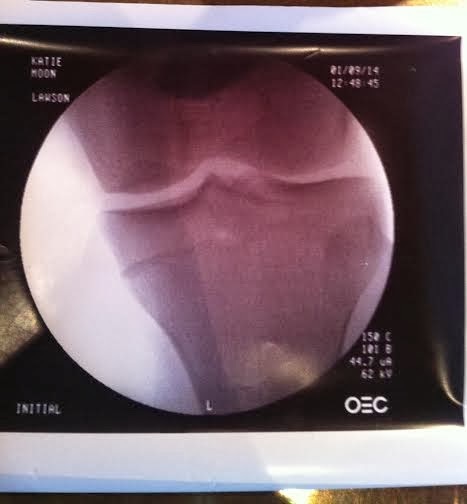 So that is my left knee. The white squiggly line you see is my cartilage. Which is the first part of my good news. I HAVE cartilage. Really thought they were going to tell me I had no cartilage left. Secondly, I have no tears and DO NOT need surgery!!! Praise Jesus!! So the bad news: I have osteoarthritis in both of my knees. These knees are showing the wear and tear of a 25 year old athlete. This was the first x-ray I have ever received, which is a praise in itself after the many years I played sports year round. My doctor said I should start receiving knee injections, however my bank account said otherwise. So for the time being I am taking supplements to help with the discomfort. I think the hardest part for me to accept in all of this is the fact that I have to take it easier than I have been. If I want to chase my kiddos around, and take them for hikes, if I want to wander the streets of Paris with my love, go ice skating, wakeboard, ever run another mile, I HAVE to take care of my knees starting now. Which if I am being transparent with you, I am not good at taking care of my body like I should. When people tell me to ice things I think of it as a suggestion. Even last night I told Adriana I was going to ice my knee after lifting... guess what I did instead? Laundry. Laundry somehow made it to the top of my priorities over taking care of my poor 60 year old woman knees. Fail. I have got to work on this. Overall I am choosing to thank Jesus for the news I received because I really thought I was going to find myself on an operating table sometime this year. Biggest bummer is that I don't think running 2/3 half marathons a year is going to cut it. Might have to look into doing more 10/15Ks. Those typically cost less though which is awesome! I am blessed. Period. Really I wanted to show you my x-ray because it was kinda cool getting to see my bones... is that weird? Oh... k sorry. Well cheers to making this a great day!